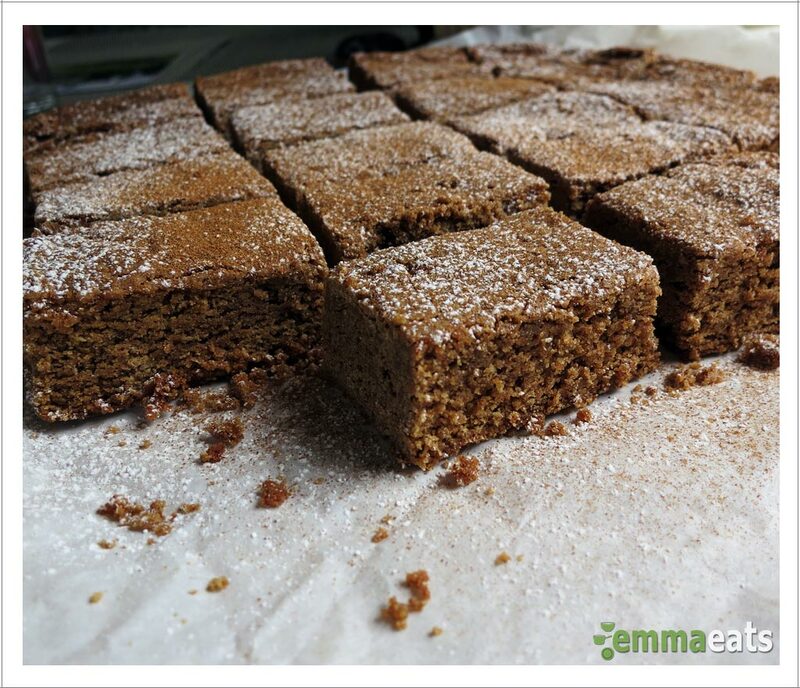 Ginger and Spice Cake | EmmaEats…and Katie too! Not all cakes have to be frilly, frosted and fantastical in nature to knock your socks off. We’re heading into the holiday season and this cake is the perfect way to kick it off. It doesn’t sparkle. It’s not iced. It isn’t fancy in any sense of the word. But what it lacks in wow factor at first sight, it makes up for with the first bite. We’ve been eating it ever since the coolness of autumn started to roll in. We all really love gingerbread and this cake is just irresistible. This cake comes together very quickly so it’s perfect for when you have unexpected guests coming. Or when you get that hankering for a little something on a chilly night to go with your warming cup of tea. Or with a tall glass of milk. Or just because. Line a 9×13 baking pan with parchment paper leaving some overhanging the edges of the pan. Preheat the oven to 350F. In a large bowl, cream the butter and sugar until it is light and fluffy. Stir in the egg, maple syrup and molasses. Set aside. In a medium bowl, whisk together the cinnamon, ginger, cloves, allspice, nutmeg, baking soda, salt and flour. Pour these dry ingredients into the butter/sugar/egg/molasses mixture and mix until just combined and there are no more white streaks of flour visible. Smooth the batter into the prepared pan using an offset spatula. This doesn’t have to be perfect. The batter is fairly stiff so you just want to make sure its thickness is relatively even in the pan. Bake for 30-35 minutes or until a toothpick inserted into the centre comes out clean. Let cool in pan on rack. Lift the cake from the pan using the parchment and slice. Sprinkle with icing sugar and additional cinnamon, if desired, and serve warm or at room temperature. Need to make this dairy-free? Substitute 3/4 cup unrefined virgin coconut oil for the butter. A handful of chopped candied ginger adds a wonderful texture to this scrumptious cake.